Travel tips to Mount Bromo is really required due to the temperature and location. Standing firmly at the height of 2392 m/dpl, Mount Bromo has cold temperature ranging from 2 degrees at midnight and 20 degrees in the day. Now you can picture how cold it is when you are there, traveling to Bromo and plan to see the sunrise. Located in East Java, Mount Bromo is one part of Bromo Tengger Semeru national park, its popularity not only among domestic tourists but also foreign tourists. Because doing the journey to Bromo takes longer time, there has to be proper planning and preparation. It is aimed for tourists can have safe trip. 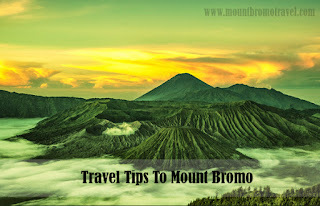 So here are some of travel tips to Mount Bromo that everyone should notice. The right time produces comfortable journey Since Mount Bromo becomes one of favorite destinations in Indonesia, many people spend their leisure time here; climbing the mountain or seeing the sunrise. Well, lots of interesting can be done here! So watch out of guesthouses and hotels that would be fully booked. That’s why proper planning and preparation is required. Dry season, from May to October, is the best time for tourists to visit Mount Bromo since they are able to enjoy the sunrise appearing to reddish round. Also, it is the best chance for them to enjoy the views and places without worrying of sudden rain. Book for hotels and guesthouses It is almost impossible for tourists coming from afar and only spends couples of hours in Bromo. Of course they need more days to enjoy their vacation. If you are planning to stay at hotel or guesthouse, especially at the weekend, you have to book it long before you set foot on the place. In addition, jeep is a transportation that would take you to cater of Mount Bromo or explore Mount Bromo and the surroundings. Booking a jeep after arriving in Bromo is not recommended since the price will rise and either you can rent a jeep or not. Keep being healthy It sounds so ridiculous when you just want to travel to Bromo and spend days there. But you cannot put aside this point since the temperature is so cold, and you will demand yourself to climb 250 stairs to reach the top of cater of Mount Bromo. That’s why you need excellent physical condition. Surely you won’t end your vacation by ‘visiting’ hospital. Things and stuffs needed while traveling to Bromo We will deal with cold temperature and rugged terrain after setting foot on place. Therefore, things and stuffs required to conquer those obstacles are thick jacket and some long sleeved t-shirts to protect the body from the cold, thick trousers for outdoor, scarf, beanie hat, gloves, mountaineering boots or hiking boots, flashlight, masker and glasses to keep eyes from dust. Don’t forget to always pay attention to these travel tips to Mount Bromo. So, after knowing about the travel tips to mount Bromo east java, do you have a planning to go to Mount Bromo by your self, ? lets call us.